Yesterday I mentioned the game Scattergories....ever play it? It's a board game. Each player is given a card with categories (i.e. boys names, cities, things in a classroom, etc...), then you roll a huge die that has the letters of the alphabet on them. Whatever letter comes up everyone has to come up with a word in that category in the allotted time. Except....sometimes when a crappy letter comes up...everyone says "OH ROLL AGAIN!" That's how I felt about the letter "I" today! And here's a confession...as I prepped for A-Z and struggled with topics for certain letters...I said to myself..."Aw heck, if you can't think of something, just pick a color for the letter and do a color palette." So here you are...INDIGO....and a scene you might not think of, when you think of the color indigo - but the colors in this palette were ALL sampled from this photo! I don't know about you, but I'm always amazed at the colors that nature cooks up. 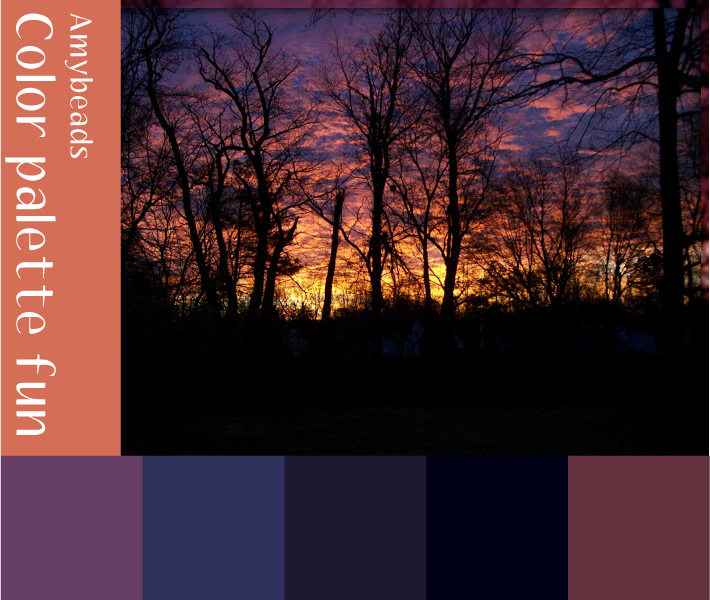 I agree "I" is a hard letter, but you picked a good color and a gorgerous sunrise to do an indigo color palette from. I enjoyed the wonderful color in your photo. Nature always amazes me. Beautiful colors in this photo! I love that picture and the palette. Indigo or any shade of blue is awesome. Great posts! I love beading and jewellery making, hoping to get back into it once I've moved house. And worked out which box it's all in! Indigo is a good choice. The palette shows the colors we don't often consider together so I find it really interesting.